Semantic web, the platform that could enable new businesses to rival the likes of Google has for a long time been a distant promise. Much of this has been because the standardization bodies have focused on too difficult and impractical technologies instead of building it on top of existing web implementations. Microformats are a more pragmatic approach: by using simple naming and mark-up conventions the semantic information can easily be added into web pages that will then suddenly become readable by both humans and computers. Microformats have been around for a while now, but have so far remained quite exclusive to a small group of web geeks. This is about to change, though: Yahoo! 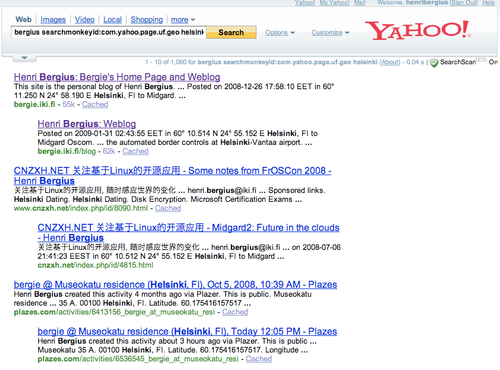 has announced that its search service will utilize Microformats to present much more useful results to end-users. And Google will likely follow. This means that suddenly search engines will understand about addresses of companies, product reviews, event scheduling and many other things, and will make these easily accessible to consumers. At the same time, Firefox 3 is nearing release and will support Microformats directly, so extensions for doing it may not be necessary. With both browsers and search engines covered, Microformats should quickly become very easy to find and utilize. 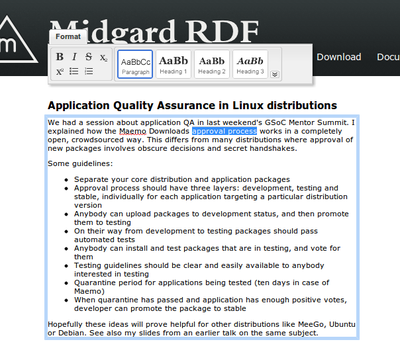 So now our users and customers will start to reap benefits from the fact that we've been seeding Midgard CMS default templates and customer implementations with Microformats since summer 2005.